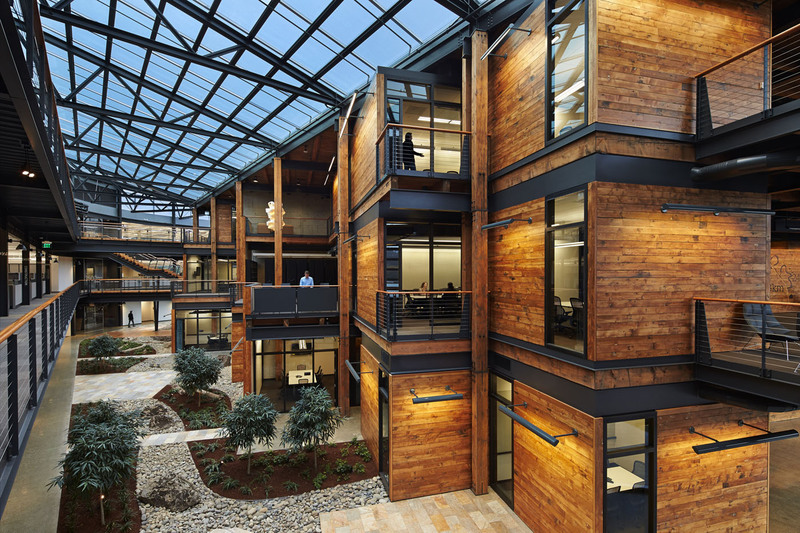 The American Institute of Architects (AIA) recently awarded ten buildings the supreme honor of being the Top 10 Green Buildings in the United States. These buildings were determined by the Committee on the Environment (COTE) to actively contribute more to their natural environment than deter from it. The Federal Center in Seattle is one of the greenest buildings in the country. They do things like recycle wastewater and use all natural lighting or photovoltaic energy systems. They are conveniently located to encourage public transit, walking and biking to work rather than driving. They are an inspiration to future buildings. Norris House: Located at the University of Tennessee, this is a series of “compact houses linked by footpaths and roads to a central common area.” The paths are made up of perennial, native grass and the roofs collect rainwater that is later treated by UV lamps and carbon filtration to be used in toilets and clothes washing. Interior paint is VOC-free to protect air quality. Keeling Apartments: These buildings are temperature self-regulating, eliminating the need for air conditioning units during the hot San Diego summers. The entire building structure and its windows are designed to catch cool coastal winds. On the inside, a courtyard collects sunlight and warms rooms on the inside. Clock Shadow Building: From first look, it’s apparent that this place is green: salvaged materials decorate and structure the building. It also self regulates internal temperatures, using thermal heating and cooling systems only when necessary. Windows with sunscreens simultaneously allow for heating and cooling via sunlight and cool wind currents. Federal Center: This building in Seattle is so energy efficient that it is expected to receive a 100 percent Energy Star score this year. It is made using renewable materials (like reclaimed wood for flooring). Ponds and rain gardens are fed by on-site water run-off, while treated rainwater is used in toilets, irrigation, and much more. Marin Country School: Kids attending this Ring Mountain-San Francisco Bay school get plenty of natural light and fresh air. The landscaping around the school is also naturally supportive on native plants and helps reduce runoff and restore water to the nearby creek. Rainwater is caught and treated for reuse in the building as well, helping to reduce the school’s need for outside water sources. Merritt Senior Apartments: These buildings are located in Oakland, California. Not only are they affordable, but they are also conveniently located near the BART transit lines to promote public transport. Only native vegetation was used in landscaping and the buildings were built to minimize energy use—they make use of a rooftop solar water heater, photovoltaic panels for light, and more. Full Goods Warehouse: This San Antonio, Texas, building is used for both commercial and residential purposes. Over a quarter of its power is created using a photovoltaic rooftop system and so much rainwater is caught, treated and reused that it cuts out 74% of potable water dependency. The building is also a re-claimed warehouse, making it all the greener. San Francisco Public Utilities: All of the light fixtures in this building are energy efficient and high-performance. Wind and photovoltaic sources provide partial power to the building and there is an on-site black water treatment system that provides for all non-potable water needs. Swenson Engineering Building: This University of Minnesota Duluth building treats about ninety percent of precipitation, with drainage going to a protected trout stream. Water is retained through permeable paving, rain gardens and an underground storm water-retention system. About a quarter of the roof is taken up by a vegetated system as well. Yin Yang House: Located in Venice, California, this building maximizes internal air quality while simultaneously contributing to the external environment. It has green roofs, retains storm water, and grows native vegetation that thrives in times of drought. Its electricity is 100% provided by solar panels and an innovative ventilation system removes any need for a mechanized heating and cooling system. A house built on the site in 1963 was incorporated into its structure rather than torn down, and the space is designed to provide home and office space for one family.